Thanks for attending this year's Annual Meeting of Members. Check out the photos from the event by clicking here! On August 18, 2016, FASB issued the Accounting Standards for Not-for-Profit Entities that affects substantially all non-profit organizations and users of their financial statements - donors, grantors, creditors, board members and executives. The standard is effective for annual financial statements issued for periods beginning after December 15, 2017. Volunteer management takes an investment of time and energy, and requires systems and processes to ensure volunteers are well-supervised and used strategically. - Share best practices and tools on how to create an official on-boarding process for volunteers. Do you know "that" from "which"? Whether to use the serial comma? How to punctuate dates and states? This fun, interactive workshop on grammar and style in the nonprofit workplace is designed to help individuals improve their own writing and move their organizations toward using standard style guidelines. Diversity and Inclusion: Is Your Organization Ready? 'Diversity' and 'Inclusion' can be challenging words and concepts for non-profit Leaders. What do the terms mean? How are they achieved? Is it worth attempting? Why? Are they actually achievable let alone sustainable? What are some of the elements and resources needed to even begin? This interactive workshop will explore these questions and identify key steps in assessing readiness. - Understanding of why and when to engage in any Diversity and/or Inclusion process. - What to expect from engaging in a diversity and inclusion process. - How patience plays a part in success. Join this in-person workshop as we explore what a mature data-informed organization looks like. Learn how expertise in data management leads to better decision-making, improved internal functioning, better client engagement and smarter, smoother operations. There was also be an introduction to a new collaborative service from RoundTable Technology and Sage70 - Insight - Data as a Service. Our conference room can be rented for meetings, workshops or retreats. The space is available Monday - Friday, 9:00am - 5:00pm, and is available for rental on a half-day or full-day basis. The conference room is available to NPCC members and non-members; NPCC member organizations receive a discounted rate. For more information, contact Alexa Salamé, Executive and Board Coordinator, at 212-502-4191 extension 229. Do you need to rent a meeting, office or event space? Do you have space to rent? NPCC connects you through our Space Ads. These Ads are solely for 501(c)(3) nonprofit organizations with office space available, those seeking space, or those with meeting or conference space for rent in the New York City area. On May 4, 2017, the US House of Representatives passed the American Health Care Act (AHCA), repealing much of the Affordable Care Act (the "ACA," also known as "Obamacare"). Much has been written about the provisions affecting individuals - but how will the AHCA affect you as a nonprofit employer? While there is a long way to go before this bill is law (if it ever is), here are some things to think about as a nonprofit employer as the health care debate continues. Again, this is NOT the current law - the ACA is still the current law and all requirements are still in effect. If the AHCA was ever signed into law, employers, including nonprofits, may not be able to provide insurance - and may not be legally obligated to. The ACA required companies (including nonprofits) with 50 or more employees to provide insurance to their employees or pay a penalty (known as the "employer mandate"); this provision has been eliminated in the AHCA. As well, employers may provide more expensive plans (e.g., employees will have to contribute more), because AHCA delayed the 40% tax on high-cost employer-sponsored group health plans known as the "Cadillac Tax" until 2025. Employees would be able to contribute more to their Health Savings Account or Flexible Spending Accounts. Group health insurance may be a bit less expensive due to the elimination of taxes on medical devices and health insurers and possibly reduce the paperwork associated with reporting. The Commonwealth Fund's article on the AHCA is informative and can be found here. Meanwhile, in New York State, legislators appear close to passing a Universal Health Care bill, which passed the Assembly early in May 2017. The bill now has 30 sponsors in the State Senate, and therefore only needs two more Senators for it to pass. If enacted, the bill would establish a single payer health care system. The schedule for comprehensive tax reform has been slipping and the tax reform plan may be given to Congress after the August recess. 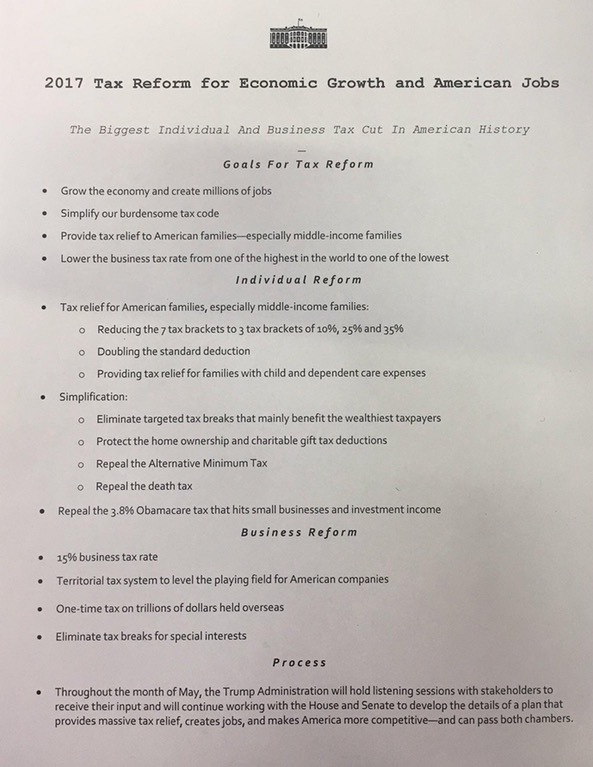 The White House released a one-page summary last month of President Trump's tax reform proposal which calls for lowering individual and corporate income tax rates, nearly doubling the standard deduction to $12,000 for individuals and $24,000 for couples, eliminating all itemized deductions except for charitable contributions and mortgage interest, and repealing the estate tax and alternative minimum tax. The National Council of Nonprofits pointed out in a statement that the plan's nominal proposal to "protect the charitable gift tax deduction" in fact harms it, since doubling the standard deductions would "effectively eliminate the tax incentives for millions of individuals and couples to give to support the work of charitable nonprofits in cities, towns, and rural areas across the country." A federal judge on Tuesday ruled in favor of Santa Clara County, who argues that threatening to take away federal funding from cities that do not cooperate with certain federal immigration enforcement is unconstitutional. The nationwide injunction does not block the government from enforcing conditions on federal grants nor does it block the government from creating a definition of sanctuary jurisdictions -- but the government will not be able to block federal funds from going to those cities as Trump ordered. Click here to read more. The op-ed, written by Sean Delany and Laura Abel of Lawyers Alliance for New York; and Sharon Stapel, of NPCC gives detailed insight on the consequences of the new state law which exposes donor information thus violating donor privacy and threatening charitable giving. Click here to read full article. The Trump Administration proposed its first full budget on May 23, 2017. It is important to note that this is just a proposal and, in fact, more of a "wish list" for the President, as Congress ultimately passes the budget. Generally, the budget appears to cut taxes for the wealthy, boost defense spending, reduce Medicaid and other anti-poverty programs, such as SNAP (food stamps), while also reducing funding for student loan programs, science and medical research and more. The proposal would increase spending for paid family leave and school choice initiatives. The budget also appears to double count $2 trillion dollars. Many of these cuts, if enacted, would have an enormous impact on the work of the nonprofit sector. This is an opportunity for all nonprofits to advocate for the budget priorities that matter most to their work. Nonprofits have the expertise, experience and knowledge to explain the implications of cutting or increasing funding for agencies or programs. We encourage you to use your voice to help decision-makers understand the issues before them and make well-informed decisions in this process. Click here to read more. NPCC held its Annual Meeting of Members on May 15, 2017 at the CUNY Graduate Center, Proshansky Auditorium with 231 members, sponsors and honored guests in attendance. This year's meeting kicked off with remarks from Rachael Pine, Senior Program Officer of Health at the Altman Foundation, about the importance of strategic planning to nonprofit management. Sharon Stapel, NPCC's President, then announced our new mission statement and strategic plan for 2018-2020, which will allow NPCC to continue to strengthen members and the sector, while also bringing us back to our roots of being a vocal and active advocate for New York nonprofits. The meeting concluded with a panel discussion on movement building and the importance of policy and advocacy to nonprofits' success. Click here to continue . The 2017 New York Community Nonprofit Excellence Awards are underway and our expert Selection Committee is currently reviewing this year's applicant organizations. NPCC manages the program in collaboration with The New York Community Trust, Philanthropy New York, and The Clark Foundation. WNYC is the media sponsor. Additional financial and in-kind support is provided by Ford Foundation, JPMorgan Chase, RSM US LLP, and Columbia Business School Executive Education Programs in Social Enterprise. The Awards provide applicants with an in-depth review of their management practices in Eight Key Areas of Nonprofit Excellence that are nationally recognized standards. Applicants will receive expert feedback from the Selection Committee and ten semifinalists will be announced in July. This year's applicants represent a broad cross-section of the New York nonprofit community, varying in mission and size, and geography. Our infographic shows a detailed breakdown of the pool. Click here to view the full infographic . Do NYC Boards Reflect the Diversity of Our City? Please take this 20 minute survey to help us understand how nonprofits think of diversity, equity, and inclusion on their board. The survey results will help inform our final report on board diversity strategies, gaps, and resources. Complete the survey and you'll receive a free copy of the report. This survey is a project of NYC Service's NYC Nonprofit Board Development Coalition in partnership with the NPCC and the Council of Urban Professionals. Your responses to these questions will remain completely confidential and the results will be reported in the aggregate. Click here to begin the survey. The New York State legislature is considering voter reform which could establish online voter registration, streamline the registration process, allow absentee ballot filing without a reason, move primary dates up, and consolidate state and federal primary elections to one day. The Senate and Assembly have passed two different bills but there seems to be an effort to find common ground. Click here to read more about New York State efforts for electoral reform. The New York Times interviewed Sister Paulette LoMonaco, Executive Director of Good Shepherd Services, to share her Sunday self-care routine. Check it out! NPower is a nonprofit that provides FREE technology training and job assistance for young adults (18-25 years) from underserved communities that are interested in pursuing a career in IT. In as little as six months, participants receive 15 weeks of in-class instruction, a seven-week paid internship, personal and professional development, and the opportunity to earn the industry recognized CompTIA A+ certification. Melkis Alvarez-Baez, Deputy Director of Nonprofit Coordinating Committee of New York, oversees all of NPCC's programs and member services. Laura Colin Klein, Executive Director of charitySTRONG since 2015 and has more than 20 years' experience working in the nonprofit sector. Rachel Anevski, Founder and CEO of Matters of Management, focuses her efforts on assisting companies carry out their missions, acquiring talent and providing coaching to executives, management and staff. Joseph Damiano, Managing Partner of Sax LLP, joined the firm in 1995 and was appointed Managing Partner in 2015. Breakfast will be served and CPE credits are available. Please contact Bianca Madrigal at bmadrigal@saxllp.com to register. With the 2017 election season quickly approaching, nonprofit organizations need to consider how they can help educate and mobilize their communities without jeopardizing their tax-exempt status. While 501(c)(3) organizations cannot participate in election season in a partisan manner, they can run voter registration and get out the vote campaigns, hold candidate forums, and produce voter guides, so long as they do so in a nonpartisan manner. Participants will be able to identify activities that could be considered partisan within the meaning of state and federal law to develop effective advocacy programs that are legally compliant. Recommended for nonprofit managers and advocates. Human Services Council is organizing a conference call with federal budget experts from the Center on Budget Policy and Priorities (CBPP) and Fiscal Policy Institute (FPI) for the New York human services sector to discuss the federal budget proposal and its implications for New York. This is a great opportunity to learn about the most relevant details of the proposed budget and how nonprofits in New York can engage on federal issues. After the CBPP / FPI presentation there will be a discussion on New York's response to federal cuts by sharing advocacy plans and actions for the future. You must RSVP to participate. To RSVP, please email Marisa Semensohn at semensohnm@humanservicescouncil.org. Join Care for the Homeless and LIU's MPA Program for a policy forum about homelessness in NYC. The Forum topics will include how to fight, prevent and end homelessness, ways to provide adequate housing for those living in extreme poverty and barriers that undocumented people face while homeless. Panels will feature leading NYC homeless policy-makers and experts, providers of homeless services, advocates and clients. The event is free and open to the public. It will include a breakfast reception and a lunch keynote address. New York Nonprofit Media hosts the 3rd annual Nonprofit OpCon, convening New York's leaders in nonprofits to share information and educate one another on best practices for streamlining operations, including automating internal systems, grant tracking capabilities, finance strategies, cloud security and more. Our partners at Unemployment Services Trust (UST) will be there so stop by their table and say hello! Click here for more information and registration . Join Chief Whaler George Weiner and GoodUnited's Founder and COO/President Jeremy Berman on Monday, June 19 from 1-2pm EST as they dive deep into donor retention data. Learn how to use Google Analytics and GoodUnited to drive donors to give year over year. Human Services Council is partnering with Hollaback! and the New York City Anti-Violence Project to offer a training on Bystander Intervention. Hollaback! 's research shows that as little as a knowing glance can reduce trauma in the face of harassment, but the wrong response can actually increase trauma. With so many eager to step up, we need everyone to be equipped with the right information on how to be an effective bystander in the midst of violence enacted within our communities. This training will be conducted by Hollaback! 's Deputy Director, Debjani Roy, and Anti-Violence Project's Senior Manager of Organizing and Advocacy, Yasmin Safdié. - Good Counsel Services, Inc.
- The Perfect Piece of the Puzzle, Inc.
Could your social media team use a boost in communication? The answer to that question is almost always "yes". Social media marketing is a project that never sleeps. With the right tools, collaboration makes life much easier for you and your team to keep assignments and timelines organized so nothing falls through the cracks. In this post from SocialMediaToday, 3 tools are outlined that can help your social media team produce their best work in the most efficient way. Click here to learn more. - Information on exemptions, renewal requirements, extensions, disclosure statements, and more. Click here to complete form and download the full report. This webinar, held on Wednesday, June 1, provided background on the law that protects 501(c)(3) organizations from demands for political endorsements and campaign contributions (known as the Johnson Amendment). If you missed it, click here to view the webinar slides and learn more.